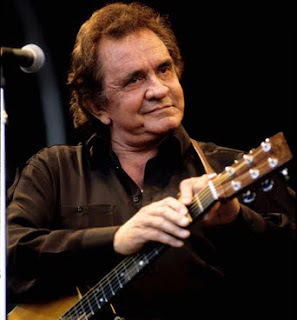 Today, February 26, would have been Johnny Cash's 78th birthday. He was born in Kingsland, Arkansas, Feb. 26, 1932. My teenage years included listening to him on the Grand Ole Opry on the radio of my old chevy. (You can hear his voice here). This is the first image I remember of Johnny Cash. 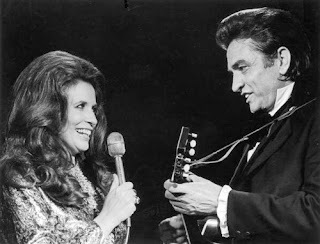 He was sitting on the deck of the house he and June Carter Cash had leased, just down the road from us on the Long Creek arm of Table Rock Lake. He'd sent one of his sisters up to invite us to come meet our new neighbors. It was a somewhat odd meeting, he seemed nervous, even shy. He and June were sitting at a picnic table, eating soup that June had made. They invited Josh and me to join them, we'd just eaten and said our no thank-yous. But Johnny never took his guitar off while he ate. He'd say a few words, strum 3 or 4 notes and go back to eating. June did most of the talking that day. Over the next 2 years, Johnny and sometimes June, would stop by and visit. They had to drive past our farm and garden to go to town and he'd often stop and buy eggs. He liked our organic, free range eggs, and he liked the farm. Sometimes he'd come by and we'd just walk around in the garden, him telling stories, me listening and feeling fortunate to have this amazing musician in my garden. He had a farm in Tennessee that he was proud of, and where he and June lived when not touring. He told me about his buffalo, about the ostrich that he had to get rid of because it tried to kill him, about the chickens he missed hearing sing. 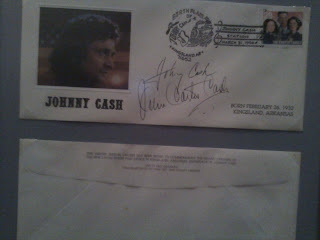 This was back in 1993 and '94, although I didn't believe it had been that long until I looked at the canceled stamp he and June gave us when the Kingsland Post Office opened for one day, to cancel the special Carter Family postage stamp and to commemorate Johnny's birthday. That was back when he and June were doing guest appearances on the t.v. show, Dr. Quinn, Medicine Woman and David Letterman. They'd come by the house and say they were flying out to Los Angeles and did we want them to bring us anything. Then in a few days they'd stop by and tell stories about the appearance. With David Letterman, Johnny was upset because Letterman wouldn't let Johnny sit and talk like Letterman did with most guests. He'd overheard Letterman say, "That guy's spooky, I don't want to have to talk to him." Johnny was hurt and evidently word got back to Letterman because a few nights later, Letterman apologized on the air. The Cash's were here because they had a music show in Branson and the show ran for almost 2 years. We went to see it several times, including when both of their kids, John Carter and Roseanne Cash were visiting. It was always a great show but the producers never put much money into promoting the show and the attendance was always low. Johnny once said to me that he could go to Japan or Australia and draw 100,000 people for a show, but in Branson he was lucky if he got a thousand. One day Johnny stopped by and went in our herb shop at the edge of the garden. Usually he just looked around the garden and visited, but that day, he said he had a sore throat and wondered if I had anything for it. He was getting ready to leave for a months' tour of Australia. I looked around for something, anything I might have that would help. In my shop I sell my books, the products and dream pillows we make, Nail Fungus Soak, but little else in the way of medicinals. But that summer I'd been making raspberry vinegar and had made some with thyme. Thyme, as you know from my last post, is an antiseptic and antifungal, raspberry vinegar is soothing to the mouth and throat. So I handed him 2 bottles of my raspberry vinegar. He paid me and left and I didn't see him and June again for over a month. The day they got back, they stopped in front of the house and got out. Johnny said in that amazing, deep voice, "I want to thank you for that vinegar, I think it saved my Australian tour. Now, I want 6 more bottles, just to keep on hand." I was so pleased I almost laughed out loud. Here's the recipe, which you can also find in my little book, Making Herbal Vinegars, along with 54 other herb vinegar recipes. Not only is it soothing to itchy throats, it's my favorite salad dressing, just by itself. In a glass container, combine 2 quarts of fresh raspberries and the 4 quarts of vinegar. Cover and briefly shake the container daily. At the end of 2 weeks, strain out and discard the berries and replace with 2 quarts of fresh berries. Cover, shake daily for an additional 2 weeks. Strain out and discard the well-drained berries, then filter the vinegar through a cheesecloth or coffee filter. Add 1 tablespoon of brown sugar, stirring to dissolve, and add the sprigs of fresh thyme. Bottle and keep out of direct light, such as in a pantry or kitchen cabinet. It will be ready to use in one more week. I've always found that famous people like to be treated as just people, and so I've never made a fuss over the people I've met. I never once asked Johnny or June to take their photo, something I've regretted over the years. They certainly wouldn't have cared, and it would have been nice to have. But I always treated them like neighbors, and they treated us the same way. I've a basket that June brought one day from an antique store. Another time she brought me a glass cake plate she'd found because it reminded her of one her mother, Mother Maybelle Carter had. Happy birthday, Johnny! We'll have raspberry vinegar on salads today to celebrate the memories of you as our neighbor. So today I was checking out the garden, sunshine had coaxed me outside, and I noticed how nicely red many of the thymes are. Standard creeping thyme (Thymus serpyllum), is sometimes used as a ground cover, but in the Ozarks we grow it along the edges of raised beds. Normally green in color, in winter it takes on a reddish hue. I throw a few sprigs into chicken when it's cooking. If you've ever looked at the ingredients in Listerine, you may have noticed there are 4 ingredients besides water and alcohol: menthol, thymol, methyl salicylate, and eucalyptol. Translated out of plant Latin, that is simply oils of: mint, thyme, birch twigs and eucalyptus. (Methyl salicylate, or oil of wintergreen, is now manufactured artificially, but originally, it was made from birch twigs). Listerine was created by Dr. Joseph Lister, a pioneer in the use of antiseptics during surgery. It soon became popular for oral surgeons to use, but only took off as an over the counter product in the 1920s when Warner-Lambert, the manufacturer in St. Louis, created the term, "halitosis" as a medical condition. Promoting their product as a sure cure for bad breath , Listerine became a household name. For many years it was marketed as a preventative for colds, a treatment for gum infections and more. It does all of those things, but the company no longer makes the claims. While traveling in Bangkok a few years ago, I was hurrying through the night market and stepped into a hole at the edge of the sidewalk. I scraped my leg and and it was late at night (the night market goes from sundown to 2 a.m.; the whole I stepped in, was the drain where all the rotten vegetables and refuse were dumped - not a great place to get a scraped leg). I went back to my hotel room, washed my scraped leg with soap and water and doused it with Listerine. It's a good antiseptic. So is thyme. 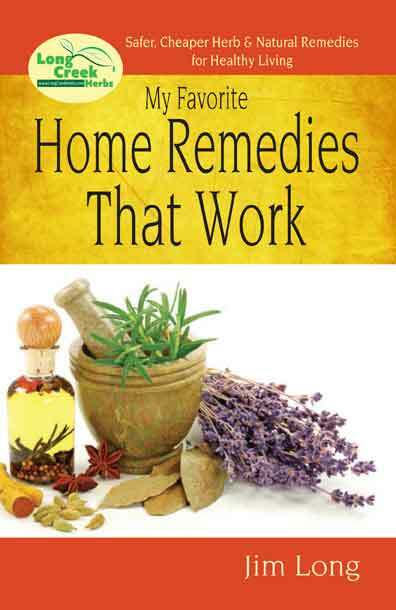 You can make a strong decoction, or strong tea, of thyme leaves and use it as a mouthwash if you have cuts or sore places in your mouth. Some of my other thymes are looking pretty good, too. 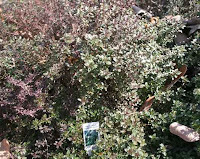 The orange thyme (Thymus fragrantissimus), which is a more upright thyme with a pleasant orange fragrance, looks good any time of year, a bit grayer in winter, greener in summer. And next to it, the upright version of lemon thyme (Thymus citriodorus) shows no signs of damage from the snow, ice and below zero temperatures we've had. 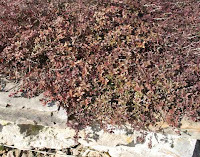 The creeping lemon thyme (Thymus citriodorus 'Creeping Lemon') is nicely robust in winter. Next spring it will green up and start blooming with deep pink flowers. The upright lemon thyme is easier to harvest than the creeper, but the lower growing one has the best lemony flavor, in my opinion. Try my lemon balm cake, which has lemon thyme as one of the ingredients. The recipe is here, on my Herb of the Year blog. I have another version I used when Nature's Garden featured my garden a couple of years ago and here's that recipe, but without the lemon thyme, from my Recipes blog (you might enjoy browsing that blog, too). I'm not sure why I left the thyme out of that oane, maybe because that time I used a cake mix; usually I just make the cake from scratch. But there are 2 versions of the same cake, just made a bit differently. 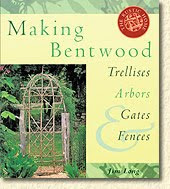 (And if you do a search for "Jim Long's lemon balm cake" you'll find several versions, some going back to 1992 and scattered throughout my Making Bentwood Trellis books. Yes - even when making a bentwood trellis for the garden, you need cake!) Here's an early version of my lemon balm cake recipe, actually pages from my Bentwood Trellis book, that I had no idea was on the web, listed on Google books. If you don't have thyme in your garden, you need some. Whether creeping thyme for cooking, lemon or orange for preparing seafood or desserts, or just a little bit for a groundcover between stepping stones, this is one hardy plant, year in and year out. Happy gardening! When I was 5, I thought Valentine's Day an almost perfect holiday. The first graders were busy making and giving Valentines to each other. 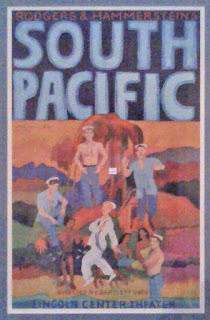 The holiday seemed perfect because it included art, my favorite subject, and it contained attention, through the mail, from my distant relatives. Betty, my next door neighbor, and I, set up a mailbox halfway between our houses. The mailbox was just a large tin can, stuck between the fence boards next to our barn, but Betty, who was already in the first grade, would make valentines just for me. And I, wanting for all the world to actually be a first grader, too, would spend days making valentines out of construction paper and homemade flour-and-water-glue and cut out the envelopes and make little postage stamps and post them in our mailbox. I wanted Valentine's Day to last forever, and somehow stretched it all the way to Easter when a whole new genre of artwork arrived. I liked the way of folding a sheet of paper in half and cutting out a heart, then seeing what I could make out of it. 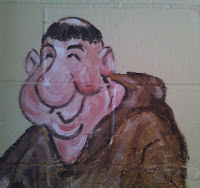 I didn't care anything about the sentiments, I had never heard of St. Valentine, I just liked making cards out of paper. Our friend, Billy Joe Tatum, for the nearly 30 years I've known her, likes to make valentines, often collages from magazines, laminated together, and mailed from either Romance, Arkansas (a service the Post Office offers), or Kissee Mills, Missouri. She sends a package that holds a few dozen valentines, ready to send, and the post office postmarks them. Driving along the road across Tennessee last week, snowy, cold, dreary day that it was, I spied this barn and had to turn around and take a pic. You may even see some snowflakes in the photo, between my open, truck window, and this handsome barn. 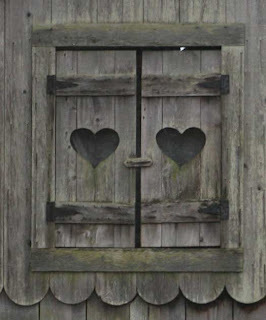 It made me wonder who designed it, a man for his wife, who had been asking for a barn for her favorite hobbies? Or maybe the woman had it designed and built for her husband's hobbies? And because V.Day has evolved into a day of food more than it has cute paper valentines, here are some recipes to play with. 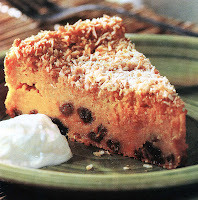 This first one, Sweet Potato Pudding Cake, is from the January issue of Eating Well, a magazine I like. It's pretty darned tasty and has its origins in a traditional Jamican sweet potato pudding. Preheat oven to 350 deg. F. Coat a 9 in. spring form pan with cooking spray. 1/2 cup unsweetened coconut, 2 Tbsp. brown sugar and 1/8 tsp. cinnamon, mixed together. Sprinkle over cake and bake for 1 hour to 1 hr. 15 minutes, or until a knife inserted in center comes out clean. Let cool then top with whipped cream. Or make this for V's Day, from my book, Growing the Top 10 Most Popular Herbs. About 4 1/2 Tbsp. cold water. Grind together the sugar and lavender flowers in a food processor until the lavender is broken up into smaller pieces. Mix in the flour, salt and butter and pulse blend. Add the cold water and pulse blend a few times until the dough sticks together (if it doesn't add another teaspoon of water and pulse again). Remove dough from food processor, roll into a ball and wrap in plastic wrap, and refrigerate for 30 minutes. Roll out the chilled dough until it's slightly thicker than a pie crust and cut with biscuit cutter (or heart-shaped cookie cutter). Lay on ungreased baking sheet and bake until lightly browned around the edges, about 10-12 minutes. Cool, then to serve, spoon sliced strawberries in a bowl, top with the lavender shortcake and top with whipped cream. (I usually serve this with lavender whipped cream, too, the recipe to be found in my same book). If I was still just 5, this horse photo I snapped in Memphis, would make a great Valentine's Day card. 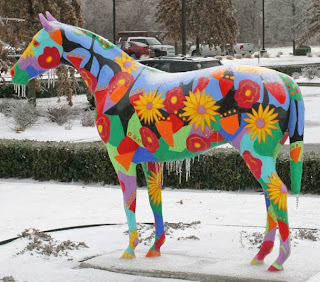 It has lots of color, icicles, stands out (I never found out why there were horses scattered about town, all painted differently). 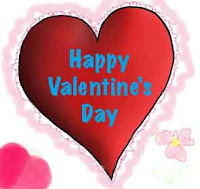 But here it is - Happy Valentine's Day, however you choose to celebrate it, from my electronic mail box to yours. The Hellebores are in Bloom! My trip to Tennessee and Alabama last week was intended to take me to somewhere warmish, and with some signs of spring. It didn't. 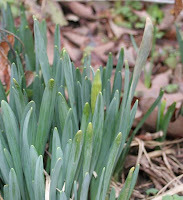 Even though central Tennessee often has signs of daffodils popping up by now, I didn't see a single one. But upon arrival home (truck full of my tree and shrubs from the wholesale nurseries I'd visited, no further transmission problems through the mountains), I found our own daffodils have buds well above the foliage. 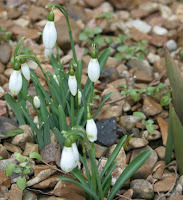 The hyacinths have substantial buds and the snowdrops are already in bloom (photo below). 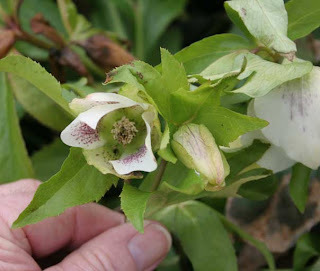 But the big excitement (for us plant nuts) is to find my hellebores in bloom. 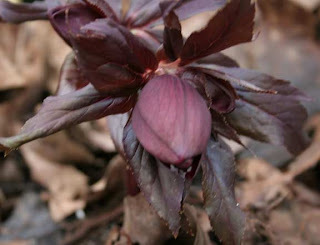 Also known by the name, 'Lenten Rose,' these tough plants start blooming in late January and will still be in bloom in early June. I had a shade bed above the driveway where I've had difficulty finding plants that grow well there. But about 15 years ago I planted a couple of Helleborus and they happily dug in. Over the years I've added a few more and now they are happily growing and reseeding themselves throughout the beds. If you don't know this plant, it's what Barry Glick calls an, "idiot-proof plant." Barry has been hybridizing and selecting helleborus varieties for years and you can read about his work in the January issue of Southern Living. He's a fellow Garden Writer of America member so I cross paths with him at conferences. If you'd like to read more about this tough, evergreen plant, check his website. If you are dazzled the the colors he has developed and want to order some, you'll need to send him an email and see what he has available. It's entirely possible the Southern Living article generated so much excitement, he may not have any left. Being back in central Tennessee, specifically in McMinnville, was both sweet and sad. Sweet, because I used to go there every spring and buy plants from the nurseries and truck them back to Missouri. The sad part was that not much looked familiar. The nursery names were the same, but the old connections I had there are gone. I did find a few good plants, specifically an 'Autumn Sunset' maple, about 16 ft tall, with a root ball weighing about 250 lbs, along with some balled and burlapped shrubs (doesn't look that big in the pickup at top, did it?) I mention the weight because when I backed my pickup up to the back of my rental pickup in Memphis, intending to pull the Big Tree and shrubs from one truck to the other, my tailgate latch broke. That was important, in the rain, because the Big Tree would now have to be lifted up and over the tailgate! Grrr. Thankfully the nice guys I posted about before, at Enterprise Rental, hoisted the big tree up and over and into my truck. With all the additional weight of the plants, I worried for the next 7 hours of driving that the ailing transmission would go out completely as I drove over the mountains in Arkansas. But gratefully, I made it to my own driveway, Josh tinkered with the tailgate and got it open, and we now have the Big Tree and the assorted shrubs unloaded and ready to be covered by snow tonight. One plant I still have from those trips back in the late '70s, is a start of Crow's Foot Ivy, that was growing on one of the nursery barns. 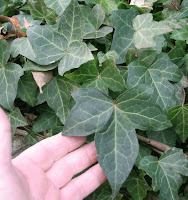 It's evergreen, with especially large leaves. Sometimes I put layers of the leaves on a serving plate to add color to a dish. (No, they're not particularly edible, but they aren't poisonous, either). The ivy grows along the edge of my house foundation and front porch. The one thing in McMinnville I'd hoped might remain, was the old Gay-Lo Cafe, downtown. On my annual spring trips years ago, the local nursery workers went there for lunch for the great home cooked meals and the place was always crowded. Over time I'd gotten acquainted with one of the ladies who owned the place and I raved about her apple cake so often she finally gave me the recipe. The Gay-Lo (named for the two owners, Gayl and Lois, as I recall) is now just apartments, but the apple cake recipe survives. So here it is, a memorial to a fine eating place in downtown McMinnville, Tennessee. It's baked in a sheet pan and is so good you will have to pace yourself. Preheat the oven to 350 degrees F. Cream the butter and sugar until fluffy, then mix in the eggs. Add the flour, cinnamon, baking soda and salt and mix. Add in the apples and mix lightly. Oil and flour a 9 x 14 in. cake pan, then pour in the batter and spread evenly. Bake for about 1 hour or until a knife inserted in center comes out clean. Melt the butter and brown sugar, adding in the flour then the water, mixing. Simmer for about 10 minutes until slightly thickened and add the chopped nuts. Spread over still-warm cake, then let cool completely before serving. And here's one more helleborus from my garden, the only red one I have. I'm hoping it will cross with the white and greenish-white ones I have with it. 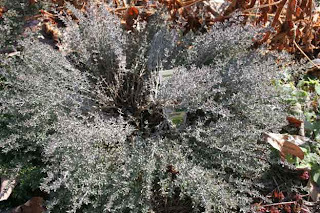 The foliage is evergreen so even when they're not in bloom, they still are attractive plants. This month I'm planting peas, onions, potatoes, bachelor's buttons, poppies, dill and cilantro. Spring isn't here, but early planting time is! Here's what I had in mind when I thought "anywhere south and warm." Yesterday I took the pickup in to a transmission shop with the intention of doing what I'd read about on-line, which was, have the transmission flushed and add a can of Lucas magic transmission fix-it. But the mechanic said a flush would likely make it worse so I just added the magic bottle of fix-it and decided I would head a bit south, anyway, but not in my own truck. I called up the folks at Enterprise Rental in Germantown, a suburb of Memphis, and reserved a pickup for today, Tuesday. Remember that episode of Seinfeld, where Jerry reserves a car at a rental agency and the whole episode is about the fact a reservation implies you actually have a car to rent? Well, that's coming. But first, my Garmin navigator decided there was no such address in Germantown and I spent an hour trying to get to an address that was only 20 minutes away. This is the 3rd time my Garmin has malfunctioned and led me on a wild goose chase. But with multiple phone calls to and from the rental folks, I arrived. Minutes go by while I'm filling out forms. Then a phone call comes to Joe, who's waiting on me, telling him that somehow, someone else had rented out my already reserved truck and they didn't have one for me. He laughed, embarrassed, I laughed and reminded him of Seinfeld. He offered me a cargo van. He showed me a little mini-something or other, then made some phone calls. They'd found a truck for me, a larger, nicer one than I'd reserved, but it was an hour away. I'd take it, I said and went off to get some breakfast. My truck arrived and Joe gave me a loaner Garmin since mine was being useless and sent me on my way. While I waited, we talked about writing and gardening. Once again, I crossed paths with a very fine fellow. 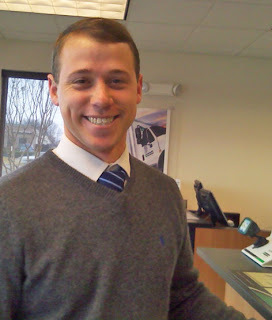 In my own business we always try to treat our customers like we would like to be treated and it was a nice start to the day to have Joe at Enterprise Rental, treat his customers that way, as well. Once again, my day started off with an interesting and helpful person. So where did I head? To McMinnville, the wholesale nursery capital of the world. I used to drive to McMinnville every spring to buy nursery plants and have not visited the area in nearly 25 years. I used to have a favorite restaurant there, the Gay-Low, where all the locals went for lunch and I collected several recipes from there over the years. I learned tonight from a local lady, the restaurant's been closed for years. Speaking of food, I was tickled when my friend, Alan, took me to a new place, Brother Junipers, in Memphis for breakfast. It's one of those great out of the way eating joints that only the locals know about and this one made me downright envious of people who can find a place like this on a whim. Such places do not exist in my neighborhood. Imagine a place where the locals go, where it's a mixture of professors, professional & working people, students and local folks. The service was outstanding, the food was great and the waiters even offer you a cup of coffee to take with you afterward. 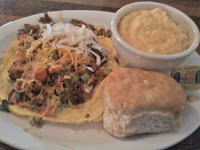 Alan and I both had the Firehouse Omelette: a 2-egg open face omelette, spread with guacamole, topped with grilled chorizo, black beans, jalapenos and salsa and topped with grated cheddar cheese, served with cheese grits and homemade biscuit. 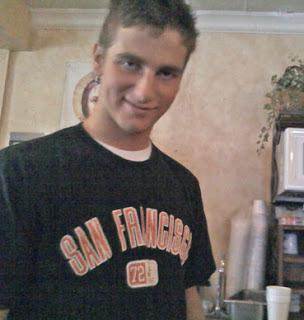 I'm not sure where our waiter, Zach, learned to be such a good waiter so young, but from what I saw, the entire wait staff was well trained. The wait for a table was about 30 minutes and well worth it. Zach said the original Brother Junipers restaurant is in San Francisco, but this one's been in Memphis for a couple of decades. It's at 3519 Walker Ave. in case you're ever in Memphis and want the best breakfast in Memphis (they've got the awards and plaques on the walls to prove it). 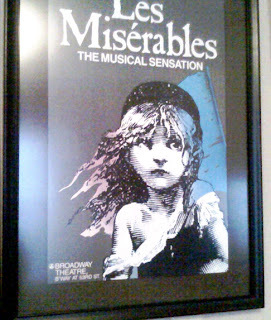 So the days of being snowed in and iced over in Memphis could have been like Les Miserables. But I had a delightful evening with my cousins Bob and Myra and family over dinner one evening. Alan and I explored the best kept secrets of Memphis eating establishments, and over and over again I met folks like Melverdia and Joe and others who just proved there are a lot of really fine folks out here in the world and I'm just lucky to get to meet them. Now, off to the wholesale nurseries and see what the plant world has to offer this spring.